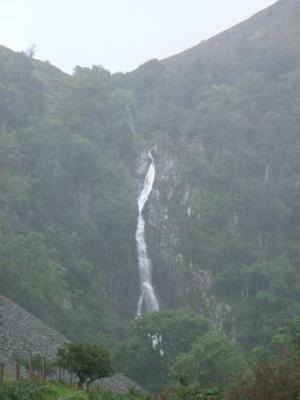 It is approximately a 3mile round walk to Aber Falls (Rhaeadr Fawr in Welsh). 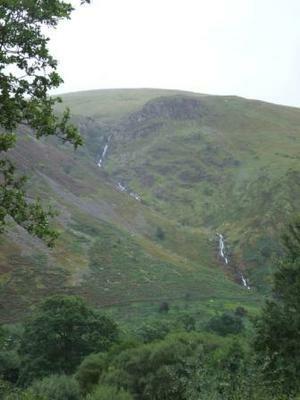 The path which leads up to the head of the Aber Valley is well maintained and not difficult. On the way there are panels and a small exhibition explaining the ecology and history of the valley which has been inhabited since the Bronze Age. 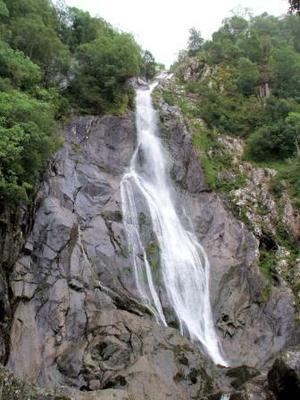 Rhaeadr Fawr plunges 120feet (37m) down the rock face in front of you. The path leads right to its base, so you can get very close. Just downstream there is a bridge, if you cross it and continue your walk you will eventually come to a smaller fall called Rhaeadr Bach. Unfortunately it was such an awful day pouring with rain we only viewed it from a distance, this also accounts for the poor quality of my photos.